Wouldn't it be nice if you could cook, bake, and dehydrate food without paying for or relying on electricity? How about no-mess cooking while camping, after a natural disaster, or in your own backyard so that you don't heat the house in warm weather? I am amazed that all of that is possible with solar cooking - harnessing the immense energy of the sun to cook your food! 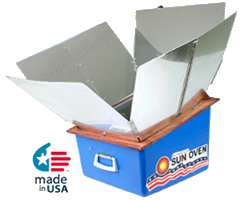 Today I want to tell you about the unique American-made Sun Oven that is used all over the world. It's free: After the initial investment of buying a sun oven, there is never a need for electricity, fuel, or any type of refills! It's Eco-friendly: Using the sun to cook, what can be more resourceful and environmentally sound? No fossil fuels or electricity required! 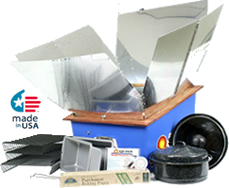 Endless possibilities: While the Sun Oven is most appreciated in the event of a power outage, it can be used in so many ways: camping and RVing, in your backyard, boating, at the park, at the beach, traveling in remote regions, living off grid, etc. The All American Sun Oven with a Granite Ware Enamel 3-quart Cooking Pot costs $349. There is also one with a preparedness and dehydrating package that in addition includes two loaf pans, multi-fuel water pasteurizing indicator, two easy stack pots with interchangeable enamel and glass lids, and multi-level dehydrating and baking rack set (3 racks with one roll of parchment paper) for $399. Shipping is included in both! I have two exclusive discount codes for you for $70 off the Sun Oven with preparedness/dehydrating package or $50 off the Sun Oven! Expires June 15th, see details here. (also available on Amazon). I think it's pretty obvious the Sun Oven is amazing! Honestly I would have loved to use one and review one myself but we have a less than ideal situation where our condo association doesn't allow us to leave anything outdoors and the shared yard is in the shade, away from direct sunlight, for most of the day. I would probably only use it for camping, but that's something we aren't up to yet with little ones. If we had a single family home with our own yard, I would be all over this thing! Since the generous folks at the All American Sun Oven had one oven available, I thought it would be perfect to give away to one of my readers! Tomorrow during the Green Your Summer event, you may enter to win the Sun Oven! 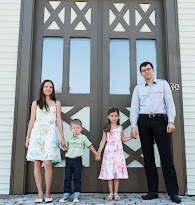 We received no payment or product for this post. All opinions are my own.